Hard Drive Inspector is a powerful, convenient and effective program based on the S.M.A.R.T. technology, which allows controlling the state of your hard disk drives. With the help of the S.M.A.R.T. System, Hard Drive Inspector allows you to predict a possible failure of the HDD before this occurs. 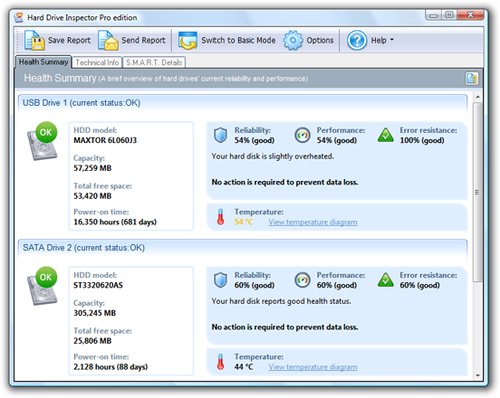 Hard Drive Inspector is a powerful, convenient and effective program based on the S.M.A.R.T. technology, which allows controlling the state of your hard disk drives. Most computer users argue that information stored on their computer is the most valuable element of the computer system. With the help of the S.M.A.R.T. System, Hard Drive Inspector allows you to predict a possible failure of the HDD before this occurs. As the access to electronic information becomes more and more vital in business and at home, Hard Drive Inspector allows exceeding the traditional limits of HDDs reliability, thus extending the level of valuable user data protection.